OLT Offshore regasification Terminal is an ex LNG carrier duly modified and permanently moored at about 22 km offshore the coast of Livorno and Pisa. 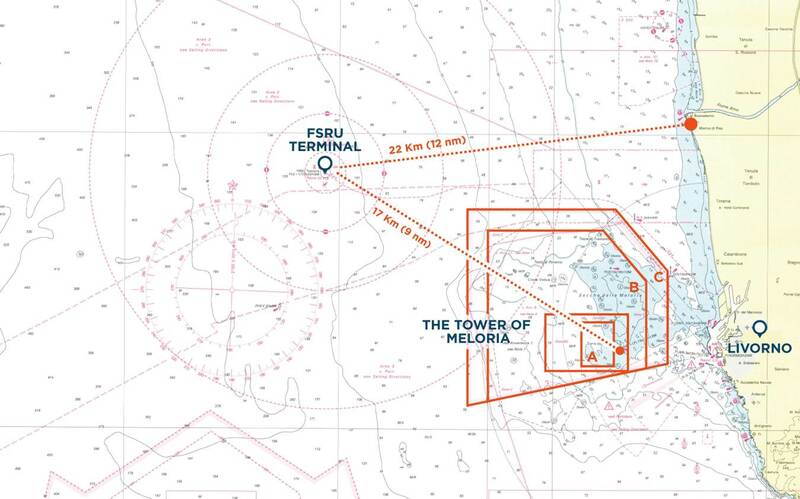 “FSRU Toscana” is located at about 22 km offshore the coast of Livorno and Pisa. Gas is transferred onshore through a 36,5 km long pipeline. 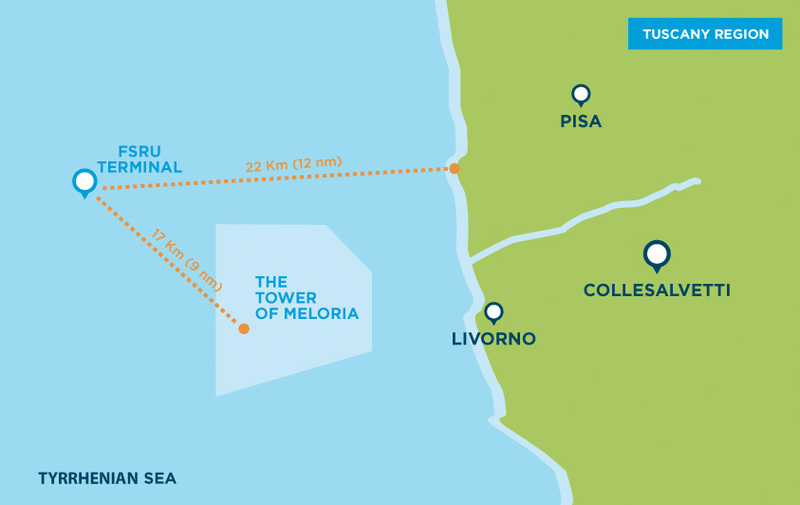 29.5 km of pipeline is in the sea, 5 km is in the filling channel “Scolmatore” and the remaining 2 km runs on land. It is completely underground and it is directly connected to the Italian National Grid. Pipeline is completely underground, it is at minimum of 2 meters depth. It follows onshore the course of River Arno’s collateral channel (Scolmatore) until it gets to a gas metering station positioned in Suese, in Collesalvetti Municipality . The gas is therefore inserted in the National Gas Network. Along the “Scolmatore”, the gas pipeline is at least at 6 meters depth to not interfere with the future channel navigability. The regasification Terminal position was chosen because the port of Livorno is suitable to support the Terminal activities. Furthermore, Livorno is located in a supply strategic position of the Mediterranean area. It is near to those territories where the gas is most used. Tuscany is one of the regions that uses high quantities of gas reporting an annual gas consumption of about 4 billion cubic meters.